Place the two coconut milks, apple cider vinegar and sea salt in a small bowl and whisk together with a fork. Allow to sit for about 10 minutes until the mixture curdles (there will not be a heavy amount of curdling, but that’s okay). Melt the coconut oil in a microwave until just melted. Allow to cool to room temperature before using. Measure out 1/2 cup + 2 Tbs. + 1 tsp. of melted coconut oil and add it and the olive oil to a food processor. 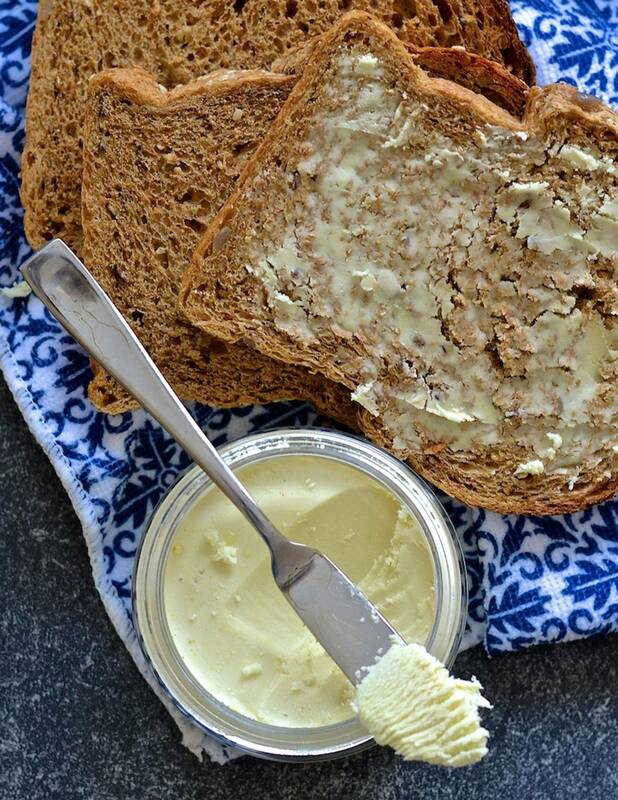 Making smooth vegan butter is dependent on the mixture solidifying as quickly as possible after it’s mixed. This is why it’s important to make sure your coconut oil is as close to room temperature as possible before you mix it with the rest of the ingredients). Add the coconut milk mixture, sunflower lecithin and guar gum to the food processor. Process for 2 minutes, scraping down the sides halfway through. Pour the mixture into a mold and place it in the freezer to solidify. An ice cube mold works well. The vegan butter should be ready to use in about an hour (I allow mine to sit in the freezer overnight, it helps the butter pop out of the mold better). Store it in an airtight container in the refrigerator for up to 3 months or wrapped in plastic wrap in the freezer for up to 1 year. Makes 1 cup or the equivalent of 2 sticks vegan butter.